CritalSoft is a team of IT specialists committed to creating reliable and cost effective solutions for both business and individuals. Our main task is to assist customers in reaching their goals through the use of modern computer technologies and the Internet. We put our entire experience, expertise and enthusiasm into the work that we do. This devotion enables us to keep the work quality on a very high level. Looking for cost effective NodeJS & Angular, mobile apps or Responsive Web Design solutions for your compay? CritalSoft is a software development company that stands for quality performance and outstanding customer support. We combine superior development, affordable pricing and great customer service to help clients to reach their business to next level. We are highly experienced in the development of Single Page Application and Responsive Web Design. We specialize in the development of web, mobile & hybrid apps by leveraging the power of various modern and cutting edge frameworks. Our top-quality software satisfies real needs with fast development cycles and very competitive rates. CritalSoft produces superior custom mobile & web applications that address real issues, while being reliable and easy to use, maintain and evolve. Critalsoft is a web development, software development and IT consulting company with expertise and years of experience in outsourced product development and custom enterprise application development with superior customer support. eazyDeposits is a simple but intuitive fixed deposits manager. It's free & essential tool for managing all your fixed deposits. This app will keep the track of all your fixed deposits maturities and will notify you on and before the maturity date. You can view all maturities year wise and month wise on a single screen, which will help you to organise with your financial planing. eazyDeposits will definitely help you to organize all your fixed deposits belonging to different banks at one place. eazyWallet is a free digital wallet and password manager for Android powered devices to store passwords, account info and other sensitive data in an easy but secure way. EazyWallet uses AES encryption which is state of the art encryption technology. It stores your passwords, your web registrations and associated information in a database (a file), protected by a single password. EazyWallet allows you to store passwords and PINs in a convenient location for when you are on the move. 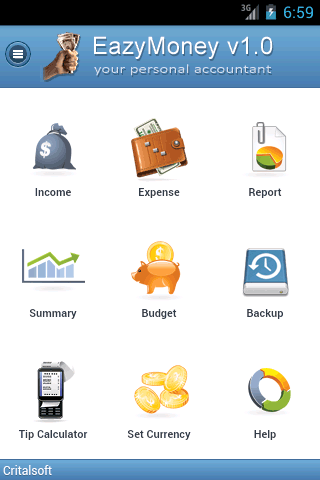 eazyMoney is a simple software for managing individual account, and its runs on Android powered devices. eazyMoney helps you to maintain your account under eight pre defined groups viz. Bank, Cash, Credit Cards, Income, Investment, Expense, Loan given and Loan taken. You create an entry in eazyMoney whenever you do any transactions. Therefore you can always look into the current status of each and every account.